A research team in DCU is working to reduce the diagnosis time for sepsis, an illness affecting almost 30 million people worldwide each year. It has killed an estimated six million and despite the fact that it is incredibly common, current diagnosis methods are 150 years old. 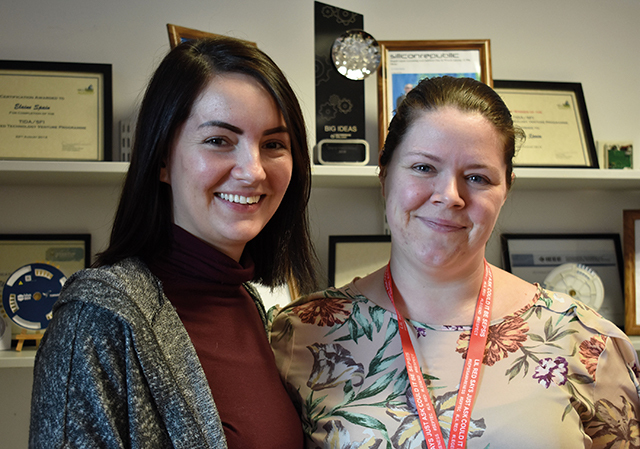 Dr Elaine Spain and Dr Kellie Adamson are co-founders of SepTec, a research project based in the National Centre for Sensor Research on the DCU Glasnevin campus, since 2014. They are working to dramatically reduce the diagnosis time for sepsis from one to six days to just 15 minutes. Sepsis occurs when the body’s response to an infection injures tissue and organs, potentially leading to death. Elderly people, pregnant women and children are particularly susceptible to the illness. Diagnosis time is critical for sepsis because for every hour delay in diagnosis, there is an estimated eight per cent decrease in chances of survival. “The whole idea was to develop a rapid test to diagnose sepsis-causing bacteria as quick as possible,” said Adamson. SepTec has developed a device to diagnose the illness through a quick blood test. They have collaborated with St James’ and Beaumont hospital, completed a pre-clinical study and a retrospective study which gave them sensitivity of 100 per cent and specificity of 97 per cent. A specific result can be given which detects the presence of sepsis in blood and indicates whether it is fungal or bacterial. This helps doctors quickly decide how to treat the patient. The blood sample enters the analyser and a result comes out 15 minutes later. As results currently take so long to come back, health care professionals begin non-specific antibiotic treatment within one hour of the test. This can lead to antibiotic overuse, extended hospital stays and potential fatalities. “By knowing the family of bacteria that this is in the bloodstream rather than giving a broad spectrum antibiotic, the physician can give a more targeted treatment,” said Spain. “Our problem is the lack of samples because Ireland is obviously a lot smaller than other countries… trying to get the numbers up for our sensitivity and specificity to move forward is very slow and difficult,” said Adamson. Both Adamson and Spain completed their degrees in DCU. Spain has a background in electro-chemical science while Adamson focuses on biology. The pair, along with Professor Robert Forster from the DCU School of Chemical Sciences, founded SepTec in 2014. “Elaine and Robert decided that they wanted to apply for the Enterprise Ireland Commercialisation Fund and one of the things they were looking at was sepsis,” said Adamson. Spain’s grandmother passed away due to sepsis, which was the reason for their focus. “Back then, the awareness was non-existent. Even though they might say pneumonia, now we know that it was sepsis that actually caused that to happen,” explained Adamson. Adamson was asked to handle the biology portion of the project. They successfully received the CF fund from Enterprise Ireland and the project began from there. The team quickly realised that the necessary equipment for analysing blood would be too bulky, so they decided to build their own analyser. They hired an NCAD student to design the device which was built from scratch within six months. “We now have a fully working prototype and analyser and the next step for us is to complete the clinical validation,” said Adamson. The team are currently on their second CF fund which will run out in March 2019. SepTec was recently awarded a Science Foundation Ireland award and a One to Watch award at Enterprise Ireland’s Big Ideas showcase. Once the validation of the device is complete, the team will be looking for investment to get through the commercialisation process. “We have such great support here [in Ireland], especially with clinicians, but we do realise that to be quite successful we would have to look at the US market as well,” said Spain. “We need to validate it as much as possible. You obviously don’t want to get a false negative. False positives you can handle because they’ll be treated anyways but the biggest thing you don’t want is false negatives,” emphasised Adamson. It took six years of research and developments to build the groundwork for the technology behind the device. Spain estimates that it will take at least another two or three years before the device is on the market and it will cost between five and then million euro to reach that point. “It might be a smart move to further develop the technology in the States. There is a significant amount of funding over there, it’s a completely different ball game,” said Spain. “But the first thing we want to do is bring it into Ireland. We obviously want to treat our own first,” added Adamson. As a majority female team of two co-founders and two researchers, the group are a relative anomaly in the scientific sector. When asked about this, Spain laughed and said they actually needed to hire more men. “It is quite unusual to have a female dominated group but we work very well together,” Spain added. “I do think that there are not enough women out there in science and commercialisation of products from a science background. We’re always open to help other entrepreneurs,” she said. “Trying to get it out from research to even start the commercialisation process is really slow because obviously you’re going from one side of science into business. We have gotten over there now and it’s happening but it is stressful,” said Adamson. The main priority for SepTec going forward is to get the product on to the market. “I think we definitely have the commercialisation bug now and we want to bring the research into commercialisation,” said Spain. “We don’t want it to be left hidden away somewhere by one of our competitors, but we have already started putting in a plan for other diseases and other different markets that we can put this technology in,” she added.